Use hand gestures to emphasize important words in a speech. Exuding confidence while public speaking can seem unimaginable to some people. It’s easy to assume that professional speakers are just naturally gifted. However, underneath that confidence lies years of training and practice. Stage presence is a learned skill. When speaking to a group, focus on one person at a time for the length of a thought. When there’s a natural pause, shift your gaze to someone new. Speakers should avoid sweeping the room with their eyes or letting their eyes dart up to the ceiling or to the side, which may signal uncertainty. If your lips are moving, your eyes should be locked onto someone else’s. Plant your feet shoulder width apart when you’re speaking. Avoid shifting from side to side. Also avoid pacing or speaking while walking. Moving around signals unsettledness and uncertainty. If you want to move to another area of the stage, walk there purposefully, plant your feet and make eye contact before you start speaking again. Use gestures for emphasis. Bring both hands up ­simultaneously with open palms facing each other as if you were holding a large ball and gesture symmetrically on important words. When you’re not motioning, keep your hands comfortably at your side. Avoid clasping them, placing them in your pocket, and defensive postures like crossing your arms. Be loud enough that people in the last row can easily hear you. This may feel embarrassingly loud, but sound dissipates quickly in a big or carpeted room. To project your voice to the last row, you have to breathe and speak from the diaphragm. Place your hand on your stomach and take a deep breath so your diaphragm expands. Use this air to support your words. Feedback is critical. Most trainers incorporate some combination of peer review and video recording. Videotaping people allows them to see their leadership presence and how they are in terms of the way they speak to people. In time, we can become more aware of what we’re doing in the moment and coach ourselves to more useful behaviors. 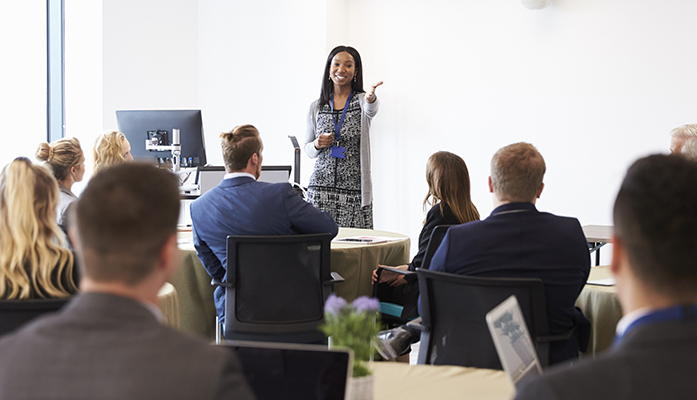 Read more on enhancing your stage presence at Toastmasters and learn about the Programs in Strategic Communication at Columbia University’s School of Professional Studies.